Here it is, almost the end of July, and I have yet to share with you a CHRISTMAS IN JULY card! What with the Paper Pumpkin boot camp, these past six weeks seem to have just flown. I had checked on the Stampin' Up! demonstrator website for the list of Christmas stamp sets that will still be available; in other words, current. My beloved Ornament Keepsakes was still on the list, so I pulled it out and went to work. 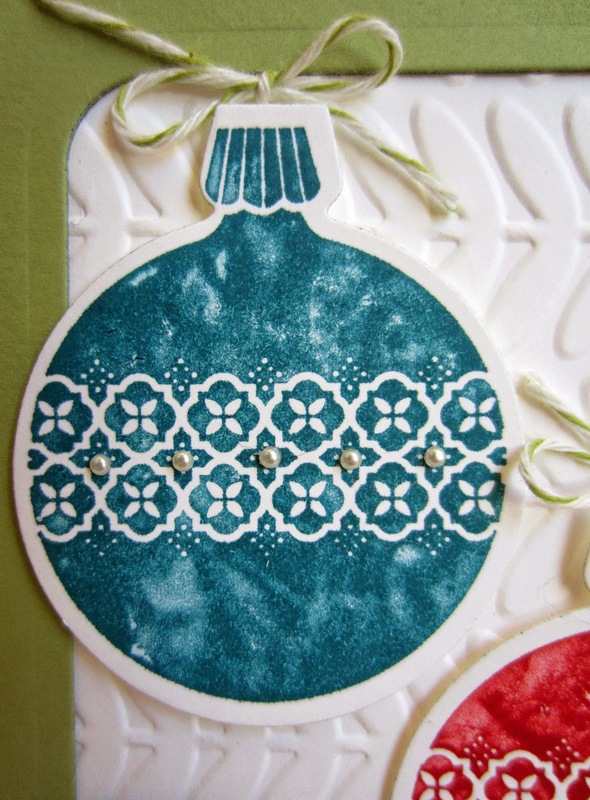 You see, I had discovered a cool technique that I thought would work perfectly on solid stamps like the ornaments in this set. 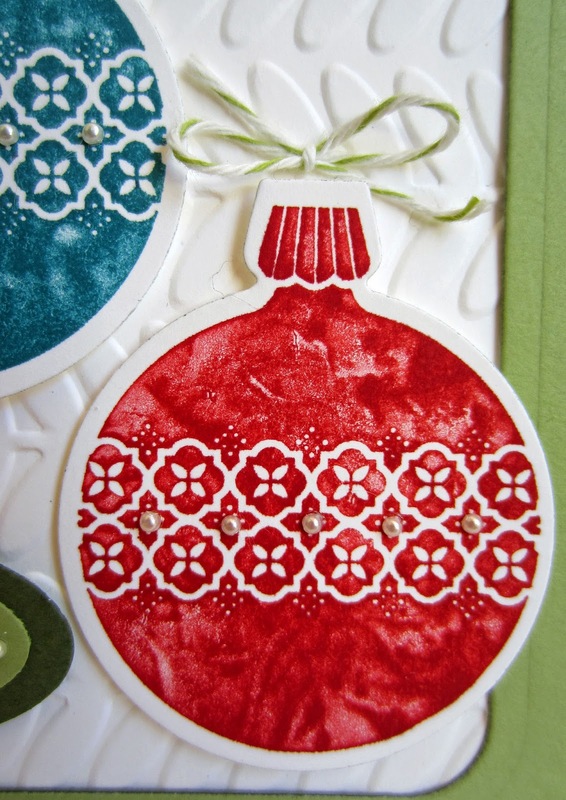 As is obvious from looking at the close-ups of the two ornaments on the card, no two pieces using this technique will ever look the same. In that sense, they are similar to a monoprint. In another sense, they are always a surprise, albeit not always a good one. Since the technique is easy enough to do though, you can redo it until you are happy with the results. 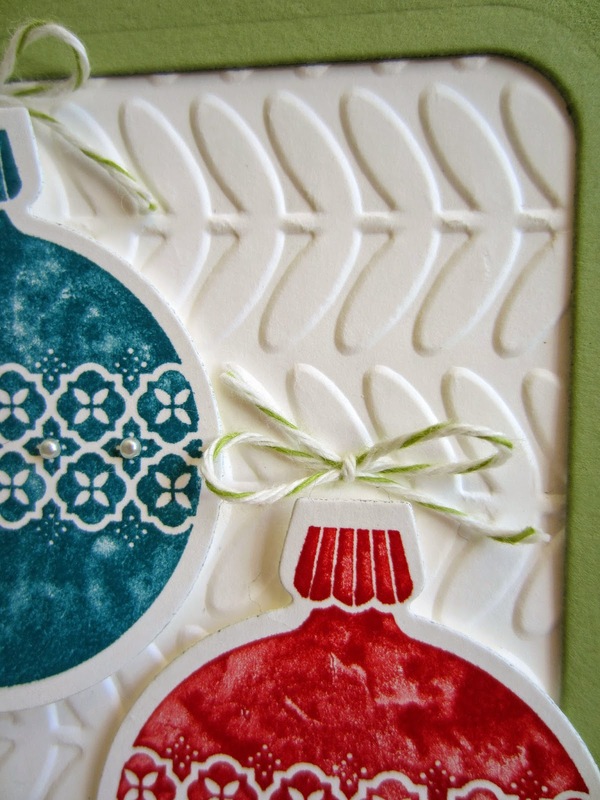 Since I want to offer a card similar to this one, using this technique, at my next Stamp-In, I would really rather not reveal anything about the technique until after the workshop. Feel free, however, to speculate on how you think it might have been done. Who knows? From your ideas, new little Paper Seedlings may be planted in our creative brains. Share any ideas you have in the comments section. 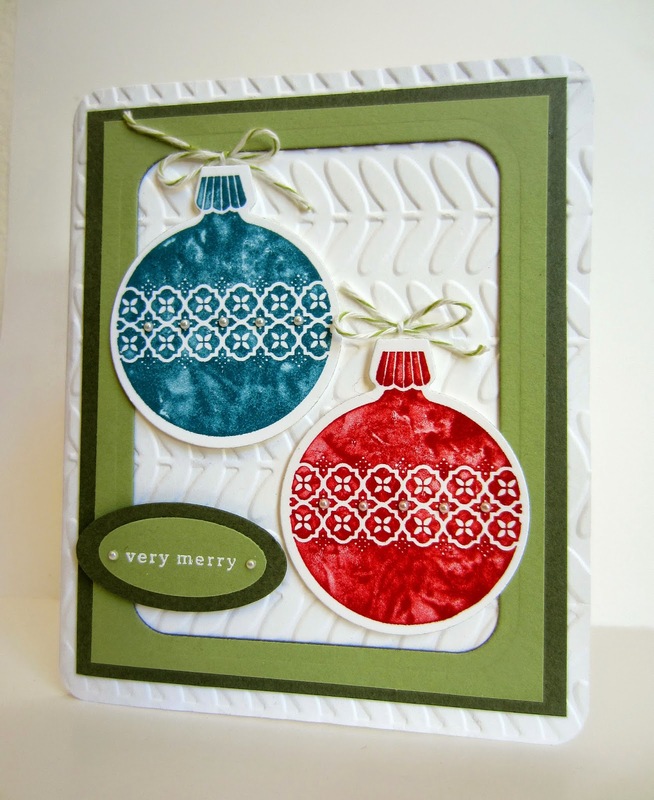 The embossing folder I used for my background was intentional in that I thought it strongly resembled regimented branches of an evergreen tree on which to hang the ornaments. Unfortunately, this darling embossing folder is now retired, but still available, here on the CLEARANCE RACK. I wish July wasn't almost ended. I am just getting into the Christmas card mood. Oh well. You will probably just have to put up with a few Christmas in August cards. Yes, please, Christmas in August cards. I'm feeling inspired by you to not procrastinate. I can see where this solid Ornament Keepsakes stamp would lend itself to the marble-ous technique. My experience with that stamp is that it didn't pick up ink evenly hence the stamped image was uneven. So, I'll quit fighting it and just marble-ize it! I have that embossing folder so I do believe this will be my first Christmas card this year. Thanks! Besautiful cards! Thanks for sharing. I love your card! Are you gonna have gloves at the stamp-in? I'm ready to have fun now! I always love doing new-to-me techniques! Pinning this one for the holidays!! I seriously love that you are already posting Christmas-related blog posts. Seriously! This makes me so happy to know that summer is coming to an end, and my favorite part of the year isn't so far away! You rock!! There will definitely be a tutorial coming after the workshop. So beautiful! I always send out so many cards around Christmas time. I would love it if they all looked as pretty as this. Thank you for linking at the In and Out of the Kitchen Link Party. Hope to see you again next week. I love these. I made my Christmas cards last year and plan on doing it again this year. This is a fantastic idea! G'day! Thanks for sharing at our #SayGdayParty! Great idea! So pretty! Love some Christmas in July! Thanks for linkin up to Sunday FUNday! Love the embossing! Good for you for getting your Christmas in July project done (I didn't quite make it-but there's always December, right?). Thanks for sharing with Pin Your Friday Favorite.